THE UNDOING is a psychological thriller based on a familiar subject, relationship. This is the story of three people who blurred the lines between family, friends, and lovers. A relationship that started on the common need for belongingness, with hopes of enduring anything together, but ended in a tragedy born of jealousy and deft manipulation. Five years after the murders, Julian Moss returned to the Blackbird Hotel to kill himself. I had a hard start with this novel. The introduction was interesting -the suicide, the spoiler, and the quote from The Raven- but it’s not arresting enough to hold me completely. I guess it came from my reading too much crime and mystery novels. So, I'm glad that my will as a finisher ruled over, or I would not have known that this is quite good. I am pointing that out because, with the plot adopted by the author, the reader needs to be totally in the zone from the very beginning to lure her easily into the next chapter. The unique timeline of this novel moves from the present to the past, until everything was sorted out slowly, but accurately, into a complete story. I think it’s the greatest characteristic of this book, which is a waste if not given a concrete introduction and the reader giving up on it after 2-5 pages in. Nevertheless, Ms. Dean wrote a solid story, the reader realized after sticking with it. It has all the fine points and sequence vital to a slowly building suspense that did not rob this reader of her imagination. Likewise, the characters were fully substantiated. Like the location, tethering on the edge of a mountainside, the characters are always on the border of breaking and catapulting. The flaws and secrets disturbingly roll off, one after another. Nothing is predictable. No one knows where the next twist will hit, only that it hits like a bus! 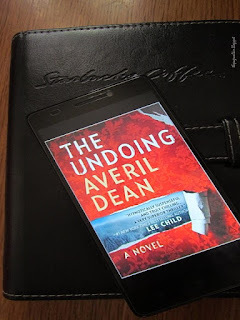 THE UNDOING is Ms. Averil Dean’s 4th novel. *Thanks to Mira for providing the e-galley of this book in exchange for this honest review.